Azek Decking engineers the best high-performance decking available. Their commitment to technology and materials innovation are at the heart of the brand, and their dedication to inspiring design and style are why the best dressed homes wear Azek. 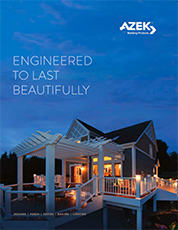 Azek Deck is engineered to last beautifully. These elegant, on-trend products are protected with Alloy Armour Technology™ (AAT), the latest in materials science innovation. So, unlike wood, AZEK decking materials resist scratches, stains, insects, moisture, mold, and mildew, and they promise protection from cupping, cracking, and more with a 30-year limited fade and stain and lifetime limited warranties. To learn more about how Azek deck products can add beauty and value to your home, visit Chittenango Lumber.